With the leaks of 8th edition floating around everywhere and the release just around the corner, we couldn’t wait to get a game in. I quickly prepped some of my favorite unites and some stuff I never play, while Will prepped a lot of his newest stuff. Curious about the Power Level system, we elected to use it and built our armies at Power Level 60. In effect I think it felt like about 1850 in 7th edition. It’s been a while since I wrote a batrep, so I kept forgetting to take pictures of the board setup, and I didn’t take notes of exactly what happened. We played the basic mission and rather than role the objective, we selected Dominion. We also setup on my smallish dining table with a play space of about 3’x4′. We decided to play along long edges, and since my army was slightly lower power level (2 points difference), I was the Underdog and got to choose whether to go first. So, first I went. Dominion calls for setting up 4 objectives, 2 per player placed in an alternating fashion. These are scored at the end of each player’s turn. We placed them roughly in the corners of the map. Unfortunately, I placed mine in spots that were hard to control for both of us. I hadn’t looked at the rules for any of his stuff so I really didn’t know what to expect. I figured a mix of light and heavy weapons and some strong melee should serve both as an all takers army, and as a good test of many of the new mechanics. Corbulo and Lemartes should help the Death Company stay alive and hit hard, and the Assault Squad in the Razorback should serve as a good anti armor unit. The Scouts should do their job to kill characters, and the Stormraven can mop up whatever is left. Assault Squad embarked on the Razorback, and Lemartes and the Death Company flying around in the air. Will brought a lot of anti-psyker and heavy armor. The Custodes in particular had me a little worried. Custodial Guard embarked on the Land Raider, and the Sisters embarked on the Rhino. This match was a meet up at our friendly local game shop. We used the Endless War mission “The Scouring”, and a basic Dawn of War deployment. We placed the six primary objectives with three on my side and three on his side in essentially mirrored positions and only one objective was placed without any line of sight blocking terrain or cover around it. I brought my Orks using the Ork Hoarde formation, while my opponent brought Ultra Marines using the Demi-Company and with a Librarius Conclave. This match was a prep game for a 1000pt tournament we are playing in a few weeks which is based on the ITC Bay Area Open rules. The scenario we chose was BAO Scenario 1, which is a modified version of Emperor’s Will including some modified maelstrom rules. 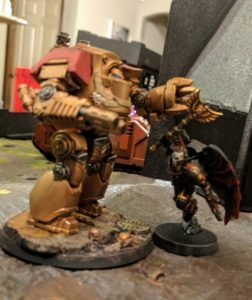 Logan brought his Farsight Enclave and I brought Blood Angels. The board had very little LOS blocking terrain, which was certain to play to the Tau’s advantages. We both rolled on Strategic Warlord Traits table. Tau got Divide to Conquer, giving me a minus to reserve rolls, harsh with that Stormraven sitting on the side lines. I rolled Strategic Genius, giving a bonus to seize the initiative and reroll reserves, so it balanced out. He placed his Primary Objective token on his side, I placed mine in a nearly mirror position on my side. He placed the first Maelstrom Objective atop the western ruined buildings, I placed one next to the ruined shrine. He rolled to deploy first.